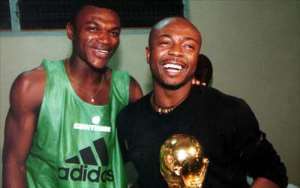 Marcel Desailly has revealed his regret at being denied an international farewell game against Ghana after the African nation pulled out of a planned friendly against France because of their busy Olympics schedule. The veteran defender was looking forward to playing against the country where he was born, but the Ghanaian federation sent a letter to their French counterparts explaining their unavailability. Ghana have now been replaced by Bosnia-Herzegovina, who will face 'Les Bleus' in Desailly's final match at Rennes on August 18. Desailly, 35, said: "This is really a shame, but that's the way it is. "I would have liked my mum to see me play against Ghana at least once." The friendly against Bosnia-Herzegovina will be France's only match before they open their 2006 World Cup qualifying campaign with a match against Israel on September 4.